Sailing Around Sicily: Luxury Charter Yacht Voyage to explore history, archeology, culture and cuisine. Charter friends and families embark on the vacation of a lifetime. 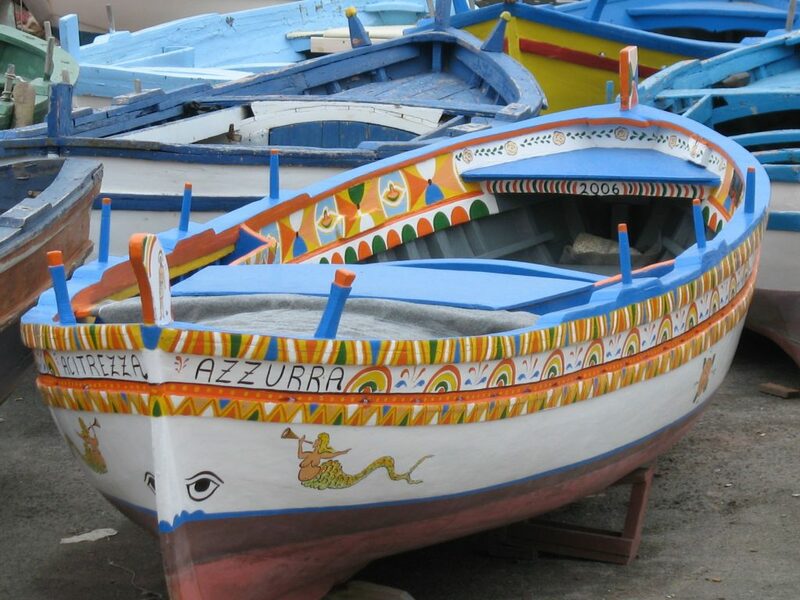 Sailing around Sicily you will discover unexpected treasures. Sailing around Sicily was once the motivation of conquerers and the privilege of kings. Imagine replicating the voyages of ancient mariners. Visit stunning coastal towns endowed by the Greek, Roman, Arab, Norman, and Byzantine cultures that once ruled them. The rich heritage is evidenced everywhere. You’ll explore a splendid variety of art, architecture, recipes, wine, folklore and six of the biggest UNESCO Archeological sites in the world. 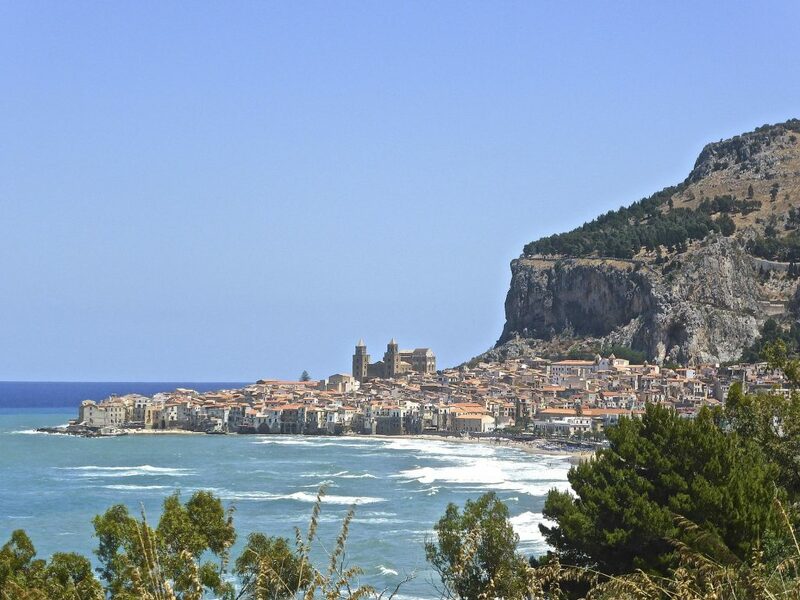 The Sicilian coastline is about 620 miles, with smaller islands adding another 300 miles of shoreline. So, wherever you cruise, you will have no shortage of beautiful beaches. Some beaches are remote, empty and surround peaceful anchorages. Others are trendy, with lounges and umbrellas in the sand, shops and beach bars on the promenade. Many front quaint fishing villages that have changed little over centuries. Each is picture perfect. Sailing around Sicily is fascinating, above and below the waterline. Divers can explore shipwrecks and archeological ruins. Sport fisherman can wrestle Bluefin Tuna, Swordfish and Greater Amberjack. Visibility for snorkeling in the clear Mediterranean is amazing. If your passions include wine and food, Sicily exceeds expectations. There are 14 Michelin star restaurants as of this writing. All but two are on the coast. While the gourmand could execute a Michelin-driven itinerary, the oenophile can steer a course to award-winning wineries. Also, popular family-run trattorias are a must for authentic, traditional cuisine. For cooking enthusiasts, several cooking schools instruct students on perfecting Nonna’s recipes. Anchor in ancient ports. Awake to the song of seabirds. Breakfast on deck as parti-colored fishing boats head out to open water. Spend the day splashing in the sea, exploring on shore, discovering amazing things. 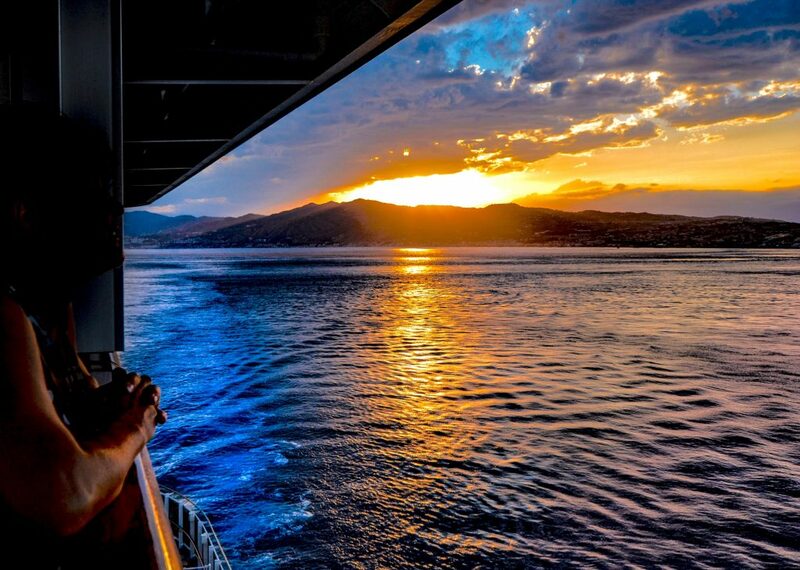 Finally, relax on deck. Savor the evening breeze, fragranced by sea salt and wood fire. Sip a local Sambuca. Three coffee beans in your glass represent health, happiness and prosperity. Watch the gradually purpling volcano spit orange sparks high into the crimson sky. 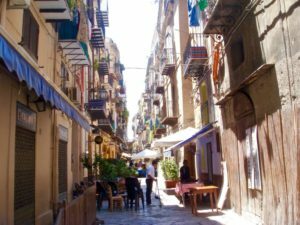 Palermo is a marvelous confection of the old and the new. The historic town lies on a crescent bay at the foot of Monte Pellegrino. It has had almost every culture in the Mediterranean world leave its mark. 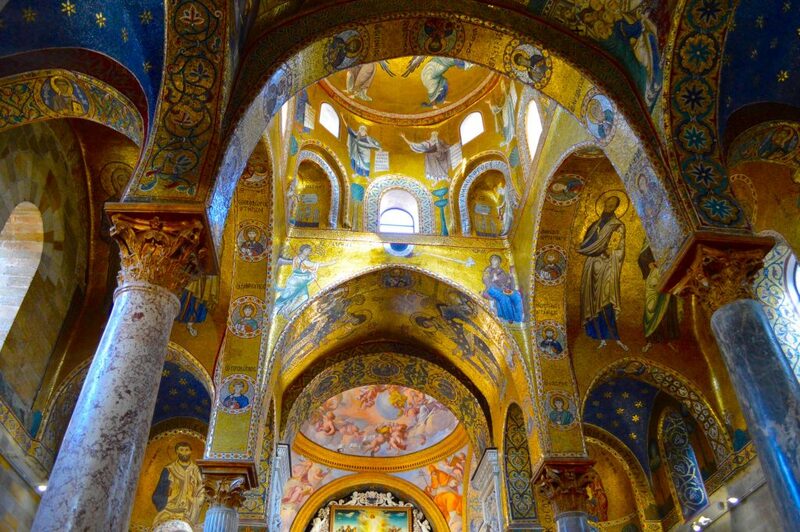 Ornate works of period art, covered in gold gilt and fragile mosaic, testify to the wealth and piety of past rulers and residents. Most noteworthy are the Palazzo Federico, the church of San Giovanni degli Eremiti, and the remarkable Cathedral. 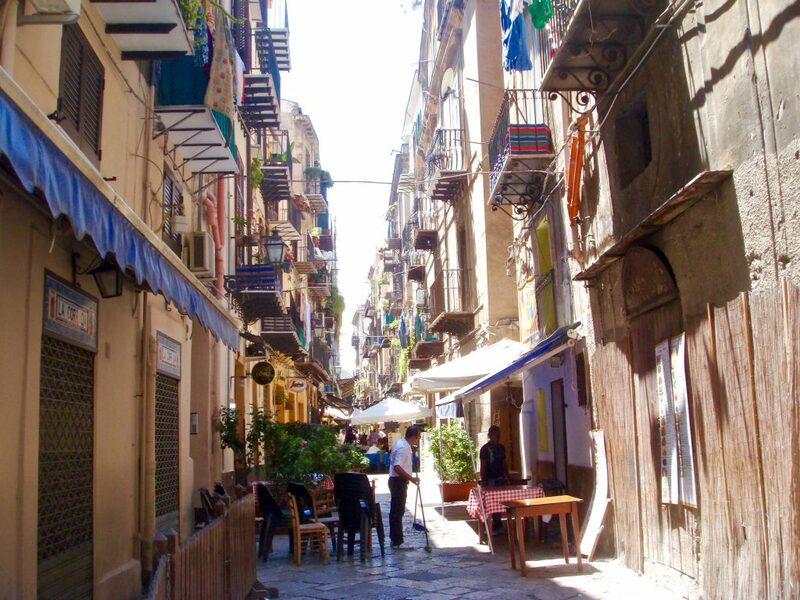 Today Palermo draws tourists and locals alike to stroll the narrow, medieval streets. Vucciria, Ballarò, il Capo, Borgo Vecchio, are the main markets. Sample breads, cheeses and exceptional street food. Settle in a piazza for fragrant Italian coffee and people watching. In the evening, join the sunset celebration when everyone assembles to stroll arm in arm along the delightful passeggiata. Cruising around Sicily by luxury yacht will inspire you. 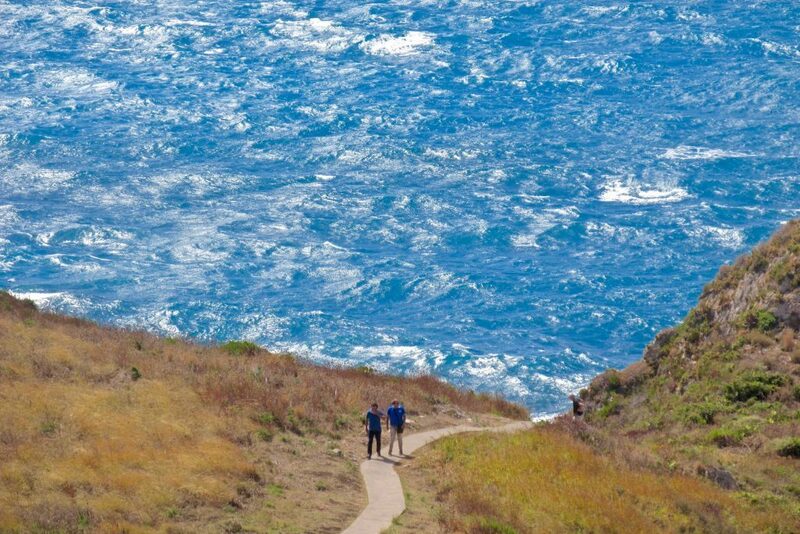 Sail along rugged coastline, past azure bays and ancient villages. The quiet harbor towns between Messina and Palermo have a timeless presence. Tindari is more than 2,000 years old. Laghetti di Maranello is a traditional fishing village. Cefalù is a delightful mélange of ancient and modern. Period multi-story houses line the shore of a lively beach. 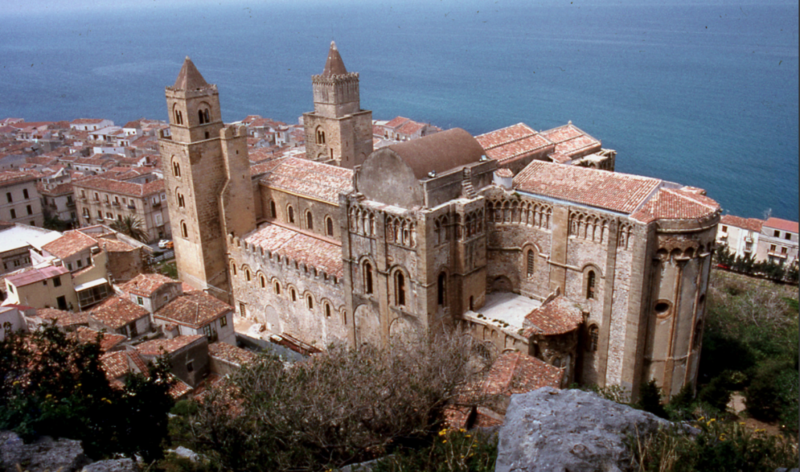 A Norman cathedral protects some of Sicily’s oldest Byzantine art. A hilltop archeological site is worth the hike for the magnificent views. As in all Sicilian towns, the evening strong along the passeggiata fast tracks meeting and mingling with the locals. It’s a festive, social atmosphere. Yet privacy can always be had at one of the waterfront cafes. The seafood is fresh, the view is delightful, and people watching is unsurpassed. 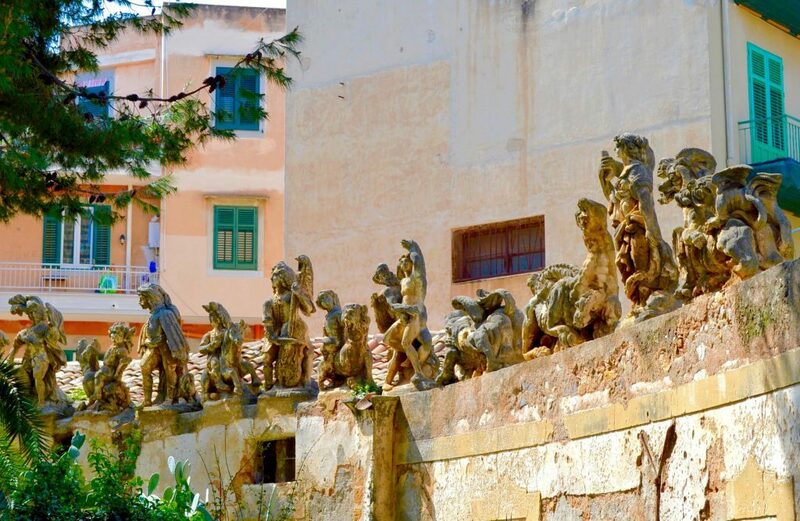 For thousands of years, Taormina has captivated the soul. 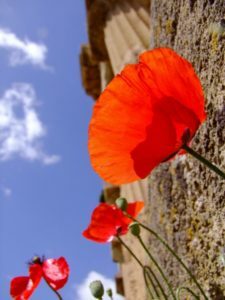 Maupassant, and Goethe, Sophia Loren, Cary Grant, and Elizabeth Taylor, Tennessee Williams, Truman Capote, Kaiser Wilhelm II and Christian Dior. All laughed beneath the wisteria dangling above the Bay of Naxos. Positioned high on a mountain with stunning views of Mt. Etna and the sea, Taormina takes your breath away. Taormina has always been a popular resort. 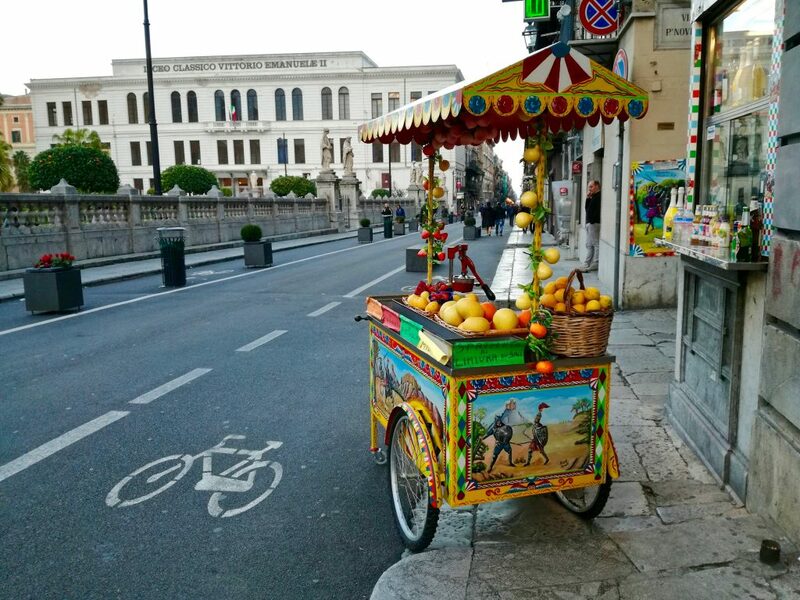 There are ancient sites, historic neighborhoods, vibrant piazzas and sophisticated shops. The main pedestrian street, the Corso Umberto, is lined with fine art galleries, designer boutiques, gourmet restaurants and several nightclubs. In the 14th-century Palazzo Corvaja is the ethnographic collection of the (free) Museo Siciliano di Arte e Tradizioni Popolari. The exhibits are worth seeing. Their lessons are both humorous and insightful. Check out the Taormina Calendar of Events. At the Greek Theater, an open-air performance magically bridges past and present. The theater, carved out of the hillside, has magnificent views of southern Calabria, the Sicilian coastline and snow-capped Mt. Etna. Syracuse is both elegantly traditional and excitingly edgy. This aesthetically delicious city is perhaps the most popular yachting destination on the island. It is also the favorite of wealthy ex-pat artists, architects, fashion designers and authors. Some are summer- and others full-time residents. The level of sophistication is appropriately high for an avante-garde crowd. And residents are fittingly posh, in a city that was once a capital of the ancient Mediterranean world. Magnificent Baroque and Renaissance buildings dominate the city. Yet they obscure the true antiquity of its foundations. The Greeks settled here in the 5th century. They were followed by the Romans and the Normans. As a result of repeated earthquakes, their signatures have been largely buried under more contemporary construction. 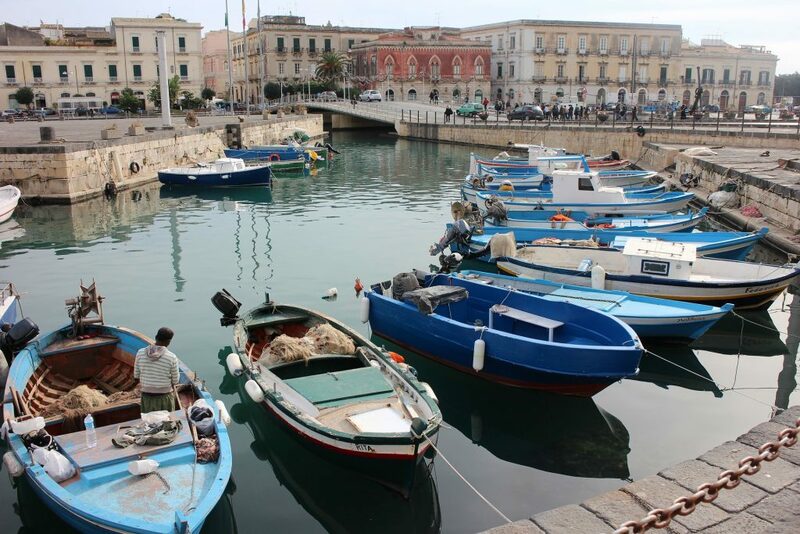 Ortigia Island is a splendid testimonial to the wealth of Greek, Roman, Medieval and Baroque nobility. The Piazza del Duomo is a trove of Baroque treasures and sidewalk cafes. Visit Syracuse’s Duomo, an archive of island history reaching back more than two millennia. Above all, sailing around Sicily is a multi-faceted adventure. It is a land that suits a fine-tuned itinerary. Awaken your senses. Feed your passions, from architecture and archeology to shipwrecks and sport fishing. In Sicily treasure lies everywhere, above and below the waterline. 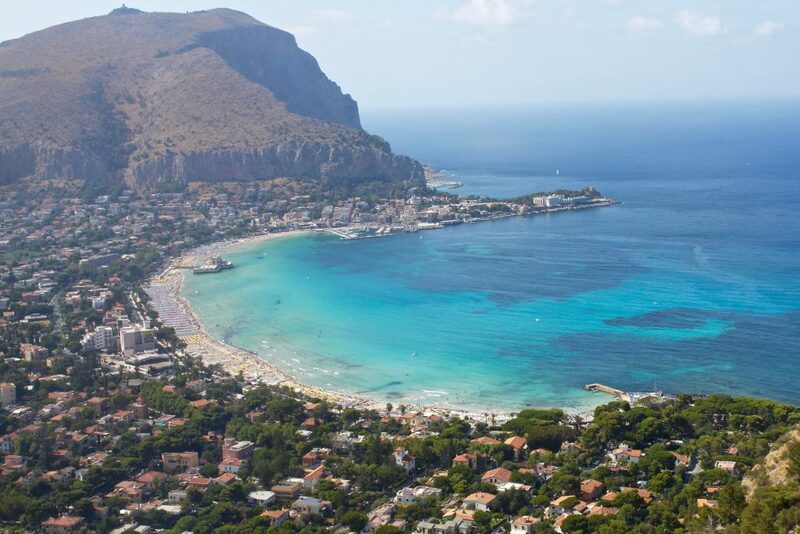 Contact Select Yachts Charter Brokers to launch your holiday in Sicily. We can design your itinerary according to your interests. The we match your charter party with the perfect yacht and crew. Trust Select Yachts to make your dream vacation a reality.